Antioxidant supplementation is often recommended to fight against oxidative stress, one of the presumed responsible for cell aging. However, any sustained physical activity leads to more or less oxidative stress which in turn stimulates various metabolic processes. But is it really bad ? What will be the impact on sports performance ? Because of its intermittent nature, HIIT is often recommended to save time. However, some sessions may take between 20 and 30 minutes, which may compare to a typical moderate intensity continuous training for a sedentary person. Is it possible to make shorter session while maintaining the cardiometabolic benefits ? Listening to music usually has a strong impact on mood and motivation. Yet everyone's musical tastes are very different. In gym, where music is broadcast continuously, it is not uncommon to meet people with headphones. What is the impact of his favorite music ? More and more people are physically inactive and lack of time is one of the main reason for this sedentary lifestyle. Interval training can reduce the duration of sessions while benefiting from positive effects. But how much is it possible to reduce the duration of a session ? During an exercise, the positioning of the body can have a more or less important impact on muscular recruitment. In Hip Thrust, how does the placement of the feet and the intention of force can alter the muscle activation ? Working on joint mobility involves a multitude of tools. In recent years, Kelly Starrett has been recommending the use of Floss Bands as a means of targeting connective tissue within the joint. Is it working ? Can we improve ankle mobility by flossing ? Numerous studies show that despite its repeated impacts, running would seem to be paradoxically a bad choice to strengthen its bone capital, both for women and men. What would be the effect of adding resistance training sessions ? The Elastic Band Resistance - A Scientific Approach to Performance, Health, and Fitness is the first book to explain the biomechanical and physiological principles that underlie elastic resistance and the value of this resistance in humans . 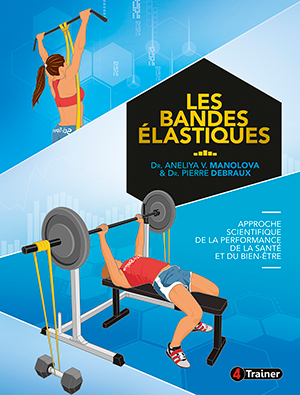 At a time when sports equipment available to consumers, coaches and physical trainers are legion, the authors, both doctors in biomechanics and sports science, dispel misunderstandings and discard the misconceptions about elastic bands training. By combining theoretical explanations based on a hundred of scientific references and examples of practical applications, this book highlights the unsuspected qualities of resistance bands for all publics. The Elastic Band Resistance - A Scientific Approach to Performance, Health, and Fitness addresses different aspects: sports performance to illustrate the potential gains in speed, strength and power, health to demonstrate interest in prevention and rehabilitation injury and fitness to explain the benefits on the musculoskeletal system of a workout with elastic bands for any public. A collection of illustrated exercises and training programs adapted to all are also available. As a guide, this book will explain many concepts while remaining accessible to larger numbers and creating a bridge between scientific knowledge and field applications. The book is available in french on Amazon.fr or FNAC.com. We are happy to welcome you on the brand new english version of our educationnal website dedicated to sport and physical activity. Since 2011, our website was a french constant growing resource for experts and people passionate about learning sport sciences and aiming to stay up-to-date. You can find out what contain the sections of the website through the different presentations below. Feel free to subscribe to our newsletter to receive a weekly summary of news from the site. You can also follow us on our Facebook page to stay in touch with us. Sci-Sport.com will evolve in the coming months. At first, an article will be published each week. With the time, this rate will increase. And this content will be constantly free and in an open access to all. The idea to create Sci-Sport.com was born a few years ago noting the growing interest of many people to find valid information about sport sciences and health. The site and the information contained therein are intended primarily for people working or intending to work in the health field, specifically in the field of sport science and exercise. To simplify access to information you will find on Sci-Sport.com different sections: Articles, Reviews, Theory, Glossary and Training & Certification. It will allow you to organize your research on our site according to your needs. 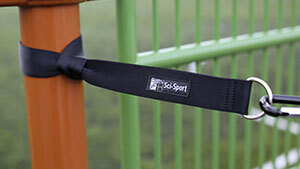 In our secured online store, you will find resistance bands from high quality natural latex. These elastic bands are perfect for strength and conditioning, fitness, rehabilitation and prevention. We ship all over the world.